Student academic dishonesty is a pervasive problem for universities all over the world. The development of innovative practices and interventions for decreasing dishonest behaviour requires understanding factors influencing academic dishonesty. Previous research showed that personal, environmental, and situational factors affect dishonest behaviour at a university. The set of factors and the strength of their influence can differ across countries. There is a lack of research on factors affecting student dishonesty in Russia. A sample of 15,159 undergraduate students from eight Russian highly selective universities was surveyed to understand what factors influence their decision to engage in dishonest behaviour. Ajzen’s Theory of Planned Behaviour (TPB) was employed to explain dishonest behaviour among students. The explained variance in the engagement in academic dishonesty equals 48% in the model for the full sample, and reaches 69% in the model for one of the considered institutions. The major findings of this study were: (1) subjective norms appeared to dominate as the strongest predictor of academic dishonesty across the Russian universities; (2) perceived behavioural control, appeared to be positively related to the dishonest behaviour. In the majority of universities, this factor was found to be insignificant. 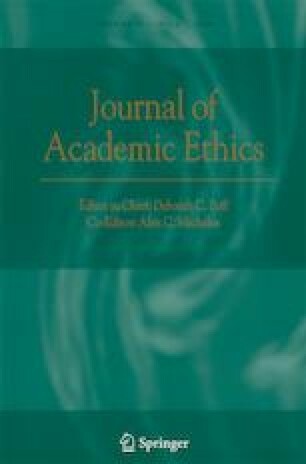 This finding indicates a specific feature of Russian students’ an ethical decision-making process discussed in the last part of the paper. Support from the Basic Research Program of the National Research University Higher School of Economics is gratefully acknowledged. Ajzen, I. (2006). Constructing a theory of planned behaviour questionnaire. Resource document. http://www.unibielefeld.de/ikg/zick/ajzen%20construction%20a%20tpb%20questionnaire.pdf. Accessed 03 April 2017. Golunov, S. (2013), ‘Malpractices in the Russian Higher Education System: Implications for EU-Russian Education and Science Cooperation’, CEURUS EU-Russia Papers, No. 9. Resource document. http://ceurus.ut.ee/wp-content/uploads/2011/06/EU-Russia-Papers-9_Golunov.pdf. Accessed 3 April 2017.